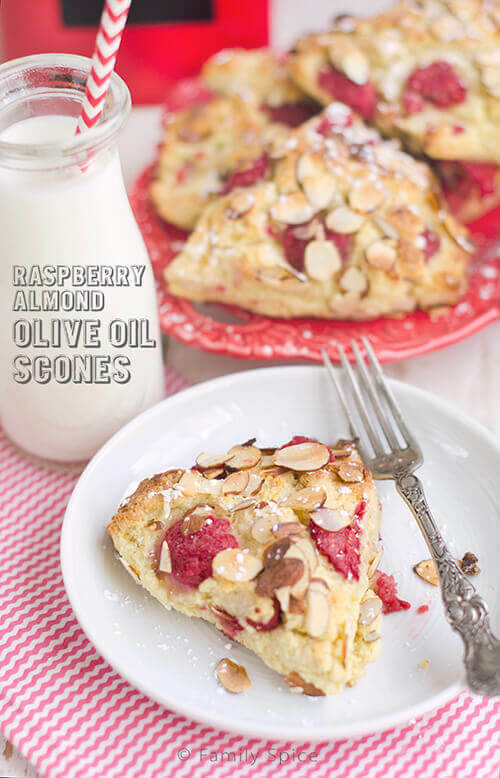 These protein and fiber packed raspberry almond olive oil scones are moist and easy to whip together for breakfast or an afternoon snack. Sponsored by Davidson’s Safest Choice® Pasteurized Eggs. he kids enjoyed hanging out with friends via countless playdates and sleepovers. I became obsessed with fairy gardens and had fun making several with my kiddos. And yes, we hunted Pokemon. But we can’t stop the inevitable. With the end of summer and the return of school I am looking forward to getting some real work done without the usual distractions and noises of the kids being home. Back to school also means back to school recipes. And the recipe I am sharing today is one of my daughter’s favorites, olive oil scones. These beauties are crumbly on the outside and moist on the inside. By using olive oil instead of butter, these scones include the brain healthy polyphenols and antioxidants. The addition of almond meal and almond slices make these scones protein dense, to keep the tummies full so the brain can concentrate on some serious learning. This week I am a featured blogger with one of my brand partners, Davidson’s Safest Choice Eggs™. You can read more about my Raspberry Almond Scones here on their blog. 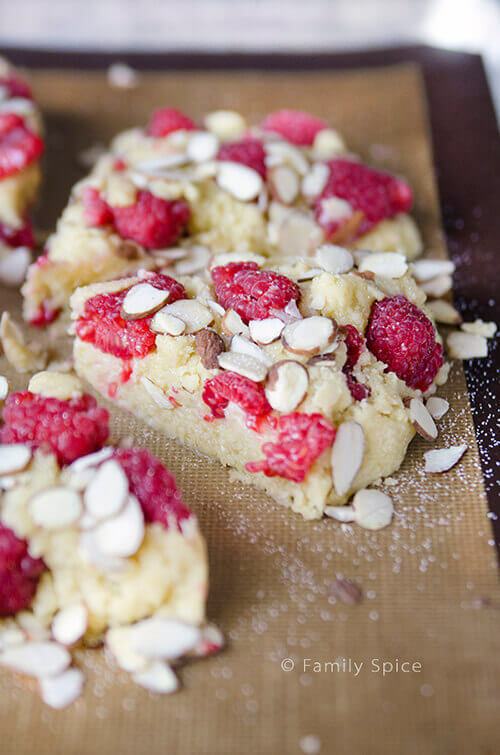 These protein and fiber packed raspberry almond olive oil scones are moist and easy to whip together for breakfast or an afternoon snack. Preheat oven to 400ºF. Line a baking sheet with parchment paper or a silicone baking mat. Set aside. Pour buttermilk mixture into flour mixture and mix with spoon or fork until rough dough is formed. Do not over mix. Turn dough onto lightly floured work surface and shape into circle or rectangle, about 1/2-inch thick. Do not knead dough. Cut dough into 8 even pieces. Place scones onto prepared baking sheet and bake until golden, about 12-15 minutes. Transfer scones to cooling rack. Serve warm or room temperature.